Wisconsin Parkour was the Badger State's first and finest provider of professional parkour coaching & consulting services. Since 2008 we have offered parkour classes and related professional services throughout Wisconsin, bringing parkour to people from all walks of life. Our organization traces its roots to the Yamakasi, the original European founders of parkour, and we have a long history of collaborating with parkour leaders on the national and international levels. 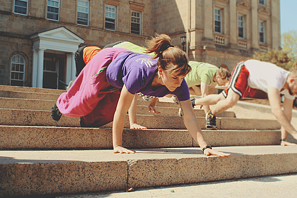 We are committed to regular professional development in order to continue to provide world-class parkour services to the people of the Badger State. Our mission is to educate, inspire, and liberate by sharing parkour with anyone willing to strive for self-improvement, in the spirit of the discipline's founders. "Parkour is the ultimate holistic discipline, a true transformative practice that requires absolute unity of body and mind to overcome the challenges and tasks in one’s path." Learn more about parkour and be part of the conversations surrounding this unique, life-changing discipline.